Uncivil Warriors is set during the American Civil War. Moe, Larry and Curly are Northern Secret Service agents Operator 14, 12, and 15 respectively, who are tasked with impersonating three captured Southern officers (Duck, Dodge and Hyde — with a running gag of the Stooges living up to those names), infiltrating the Southern command, and returning with news of the Southern position, strengths and weaknesses. After causing chaos in their own camp, the Stooges are on their way down South. In Southern uniform, the Three Stooges are soon crossing a river — “It ain’t deep!” – glub! — and make their way past a sentinel, impersonating Good Time Charlie, who “walks like this” – a funny running gag, especially when they meet up with Charlie later on. They soon run into Colonel Buttz, played very well by Three Stooges regular Bud Jamison, allowing for much funny dialog as well as wheedling the information they need out of the unsuspecting Colonel. Curly helps the Colonel’s lovely daughter, Julep, to bake a cake, accidentally putting a heating pad filled with feathers as one of the layers of the cake, leading to an extended scene where the Stooges try to eat the ‘feathery’ cake, only to start coughing up feathers. This is a routine that the Stooges did many times in their short films, but never funnier than here. Afterward, Curly cleverly destroys a letter delivered to the Colonel that would have blown their cover; however, the Stooges are introduced to Major ‘Bloodhound’ Filbert, who can “smell a spy a mile away.” The Major is suspicious of our three heroes, and when he reveals that Moe’s father is near, Larry sneaks off to impersonate him. Likewise, when the Major announces that Moe’s wife is near, Curly sneaks off to impersonate her – and then Moe has to find someone to substitute for ‘their’ daughter. He does, but unfortunately, all he could find was a black child, which he tries to pass off as being very sunburned. Since they’re exposed, the Three Stooges run for their lives, eventually hiding in a suspiciously-large tree trunk. Moments later, it becomes clear that they’ve hidden in a disguised cannon, and are fired into the air during an attack, landing on their own forces and ending the short film. In all, I truly enjoyed Uncivil Warriors, and recommend it. 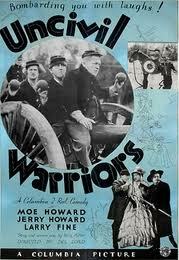 Uncivil Warriors is available on DVD as part of The Three Stooges Collection volume 1. General: They are the very brains of the entire Secret Service! Operator 15 (Curly Howard): Well, since there’s no other place around the place, I reckon this must be the place, I reckon! Operator 15 (Curly Howard): I have a riddle for the Colonel. Colonel Buttz (Bud Jamison): What is it, Major? Operator 15 (Curly Howard): There were three men, in three beds, only had 2 blankets; how did they keep warm? Colonel Buttz (Bud Jamison): I don’t know, how did they, Major? Operator 15 (Curly Howard): They turned on the heat! Operator 15 (Curly Howard): The Colonel is right, let’s have a nip and tuck! Colonel Buttz (Bud Jamison): What’s that, Major? Operator 15 (Curly Howard): One nip and they tuck you away for the night! Operator 15 (Curly Howard): [burning himself with a cigarette] I was burning up! Operator 14 (Moe Howard): Do you know what that paper was? Operator 15 (Curly Howard): Hot? Operator 15 (Curly Howard): I used to work in a bakery as a pilot. Operator 15 (Curly Howard): I used to take the bread from one corner and ‘pile it’ in the other! Operator 15 (Curly Howard): You know I quit my job at that bakery. Operator 15 (Curly Howard): Oh, I got sick of the dough and thought I’d go on the loaf. Operator 15 (Curly Howard): Oh! Operator 14 (Moe Howard): What did you’ll say the name of this cake was? Miss Judith Buttz: Southern Comfort. Operator 14 (Moe Howard): Yes, ma’am. Uh, tastes like Southern Comforter. Girl: Do you like that cake? Operator 15 (Curly Howard): If I hadn’t helped bake it, I would never know it’s a cake. Operator 14 (Moe Howard): [eating the cake that contains an oven mitt] How’s yours taste? Operator 15 (Curly Howard): Like a mattress. Operator 14 (Moe Howard): Want mine? Operator 15 (Curly Howard): I’m stuffed now. Operator 15 (Curly Howard): I’m a victim of circumstance! Colonel Buttz (Bud Jamison): He can smell a spy a mile away! Operator 15 (Curly Howard): [whispering to Moe] I’m glad he can’t smell ’em any closer! Operator 14 (Moe Howard): Is he as tall as ever? Major Filbert: No, he’s rather short. Operator 14 (Moe Howard): Well, he can’t borrow any money for me, sir! Operator 12 (Larry Fine): Pardon me, I have to take care of a weak back. Major Filbert: How long have you had a weak back? Operator 12 (Larry Fine): Oh, about a week back. Major Filbert: Where are you going? Operator 15 (Curly Howard): I left my horse parked in a safety zone! Major Filbert: Is your wife a blond or a brunette? Operator 14 (Moe Howard): Well, sir, I couldn’t say; when I first married her, everyone said she was very light headed! This is the first short where the Stooges are going through a patch of trees. Two Stooges, usually Larry and Curly, push the tree limbs forward before letting them go. When they let go, the trailing Stooge, usually Moe, has to duck a tree branch whipping back toward him. This repeats until eventually he forgets to duck and is struck by the branch. This is a recurring joke in the Stooge shorts. When Moe swings his fist in a circle and bops Curly on the head (as he first did in the previous short, Pop Goes the Easel), Curly tries it for the first time. But Curly clearly cannot get the hang of it, as he keeps swinging and bopping himself. This is the first of several Stooge shorts in which they play enlisted soldiers. The Civil War was the setting for many of those shorts, and the Stooges fought for both sides — even in the same short. In this short, Larry salutes, elbowing Moe in the face. Moe then salutes, elbowing Curly. Finally, Curly salutes, but since he is on the end, he cannot elbow anyone and grumbles to himself, “I’m a victim of soycumstance!” This would be a recurring joke in the Stooge shorts. For the first time in this short, after something bad happens to Moe, one of the other two Stooges asks him, “What happened?” Moe replies, “Nothin’!” before striking Larry and Curly. This would be a recurring joke in the Stooge shorts. This short features a rather rare stroke of creative ingenuity on one of the Stooges’ part; after Curly snags a letter meant for Colonel Buttz pertaining to Duck, Dodge and Hyde being spies, he claims to not have his reading glasses on and tries to read the letter by candlelight. He intentionally holds the letter too close to the candle’s fire and burns the letter up. He then gives the Colonel an improbable lie and runs off. The potholder gag would later appear in the Shemp-era short Three Hams on Rye during a live theatrical production. When Moe brings the black baby into the Colonel’s office there is, in fact, an extra minute or two of footage wherein Moe attempts to explain how the baby got his dark complexion, but this was edited out for televised broadcast. The introductory music over the titles is a medley of “Battle Hymn of the Republic” and “Dixie”.